This video provides a comprehensive review of IAB insertion in the clinical environment. Proper IAB preparation and handling are demonstrated, along with an actual IAB insertion. Connection of the fiber optic sensor (FOS) sensor and zeroing is reviewed. Confirmation of proper IAB placement is shown under fluoroscopy, and IABP console start-up is shown. 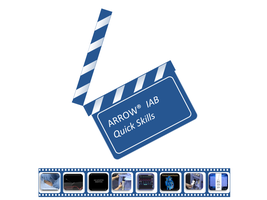 This skills section demonstrates issues that may occur when proper IAB preparation and handling are not performed or when patient conditions make IAB insertion difficult. Specific troubleshooting steps are provided to assist the clinician in a successful IAB insertion. This video provides a comprehensive review of IAB insertion in the clinical environment. Proper IAB preparation and handling is demonstrated, along with an actual IAB insertion. Confirmation of proper IAB placement is shown under fluoroscopy and IABP console start-up is shown.